Creepy is the theme for the Weekly Photo Challenge. How creepy is this to look up and be surrounded by stuffed jungle animals staring down at you with their glassy eyes, forever captured in time? These trophies can be found at Foster’s Bighorn Restaurant and Bar in Rio Vista, California. I find them rather fascinating, if a bit creepy. If this doesn’t creep you out, then perhaps this next photo will. A praying mantis decided to fly onto my husband’s ball cap, change to the light brown color to blend in (nice try) and try it’s claw at being a hat accessory. My husband thought it was cool, hence the photo–sorry a little fuzzy. 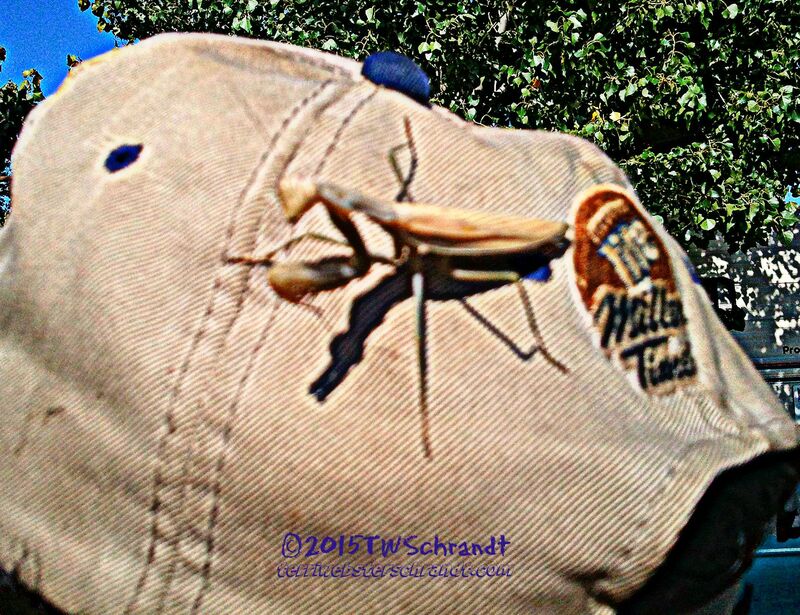 Praying mantis adorns my husband’s hat. Insects do not bother me, unless they take the form of a black widow spider, 10 million ants, or a cockroach. Praying mantises are beneficial critters but look kind of creepy with their praying appendages and all-knowing eyes. The first one DEFINITELY creeped me out. And for some odd reason, it reminded me of a story from long ago. My college roommate was a huge DOORS fan. She had Jim Morrison posters all over our room. One night, when I was alone in the room, I felt eyes upon me. I looked around and noticed that JIm was staring at me from every angle. Totally creeped me out. But your image is much creepier than that. And that restaurant is FULL of those stuffed animals–100s of them! Hmmm. Jim Morrison’s eyes–that would be weird! Oh, thank you, Deb. I will check it out! Both phtos are suitably creepy. I don’t like insects at all. Spiders are the worst. Shudder. Preying mantis pretty, giant stuffed animals very creepy! Good choices. I don’t mind bugs either. Mind you, we don’t have anything very large or creepy around here anyway. I think a praying mantis means good luck! those animals are for sure creepy! Yep. Creepy. I don’t get killing for so-called-sport. Me either! I’m glad all the hoopla over the dentist here in the US, who hunted and killed the African lion, brought this into the main media. Such a tragedy. Absolutely. That guy was an arrogant idiot but yes it did raise awareness for the issue so something useful came out of it. That’s indeed creepy! I will feel haunted already by their looks..they used to be living being.. cool entry to the challenge! Indah, the room is full of them! It’s sad but they are somehow immortalized! Are all those animals real?? That is creepy. I don’t find the praying mantis creepy at all. How neat! I wasn’t aware they could change colors! Yes, Melinda, they are ALL real. They were bagged back in the day when big game hunting was looked on as sport. Crazy, huh? So glad they creeped you out, PJ, LOL! I saw your post. Your spiders were VERY creepy!! Most spiders are our friends. Three that are not black widow, brown recluse and the aggressive house spider. Praying mantises are some of the coolest creatures on earth!